Wouldn’t you say that Guybrushs’ attempts at being frightening, evil and piratey are misguided? I mean, ze isn’t evil, is ze? Really, isn’t ze simply... a coward who wishes to overcome ze’s own insecurities? But being an inherently good-willed guy while being (or trying to be) a pirate isn’t easy, unless there are excuses for why you are perceived as evil (misinterpretation), the evil deeds done by the good guy are mistakes (motive), or, if the good guy basically is misguided (humour, forgiveness). 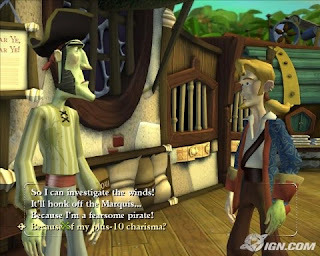 There are also the internet-roaming kind of pirates who may be written off as evil (misinterpretation) by media but nonetheless seems harmless by most of the people, an issue that Telltale for me has failed to incorporate or allude to in their first revamp of Monkey Island—possibly due to the fact that they’ve dealt with similar issues already in Sam & Max’s “Reality 2.0” and not because Monkey Island would be the wrong place for anachronistic or non-dietetic real-world humour; a U-Tube just seems like to much of a coincidence. Are there reasons for Guybrush to commit illegal acts of spite, even? The main story is similar to many prototypic video game series such as Metroid, Castlevania or Zelda where the hero starts from scratch at each new adventure. Sometimes simply because the hero is a different character than in the previous game, but most of the time because it makes sense from a game-mechanic progress and development-perspective. 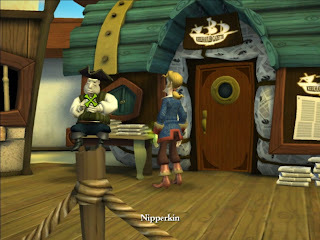 In Tales of Monkey Island you have to prove yourself as a pirate once again and must do so by committing petty crimes. Your other motives are saving Elaine and, stopping LeChuck and doing something about that pesky cursed arm of yours. But let’s focus on the actions you as a player commit, and how evil they really are. The three missions you have taken up on are stealing in order to start a fight, trick a lunatic to find a treasure, and throw a bomb to become Captain. How are these actions' evilness lessened by the narrative? Sure, the game rewards you for stealing, but it turns out the one Guybrush stole from didn’t mind Guybrush taking ze’s property. The bar-fight is caused by the cursed hand (misinterpretation) which has a will of its’ own and therefore has nothing to do with our hero (forgiveness/motive). The same character from whom Guybrush steals is the one you bomb away, but this person loved the challenge to begin with, taunted you while to tried to commit the atrocity and failed, and also congratulates you afterwards and becomes your first-mate, which lessens the impact of the perceived evil even less. When it comes to tricking Joaquin D’Oro—the person obsessed with dolls—well, ze is happy afterwards, and isn’t that all that matters? Why should I give you the Map?! Marquis DeSinge is a mad scientist, a man, yes: Tales of Monkey Island is a mans world with only 2/10 characters being female, including Elaine and Guybrush. And while we’re on the subject of representation, it’s interesting that there are so few coloured people in the game, and that LeChuck turns white when he becomes “good”. Will this whiteness or the simple good-will of LeChuck make ze a sympathetic character in the following episodes? Will we learn some kind of moral lesson through all of this? Will our lover Elaine become cursed and evil, LeElaine? Me, I'm hoping the second episode begins with an insult sword fight!